Golden Sands Resort emanates a vibe of casual, laid-back, flip-flops, Hawaiian shirts and Bermuda shorts style of ease and fun. The open-style of the resort with the large entrances and open facades blurs the lines between the indoor and the outdoor spaces, making as easy as it is comfortable to lounge on a deck chair by the pool side or under cover in a cushioned rattan chair with a cool drink in hand. Guest rooms are broadly divided in to the hill-view or the sea-view and depending on how long you’ll be staying here, a sea-view may be the preferred option. The grounds of the Golden Sands Resort are well-thought out and considerate to it’s users, with robust stone-paved areas, bordering well maintained grassy banks all surrounding the central feature swimming pool. The pool itself is not one main lido, but a series of almost interconnecting seemingly odd-shaped wells of water (see Highlights below for a further description). Dotted around these dreamy pools of fun are the sun loungers usually set in pairs, some with parasols to shade from the tropical sun and heat. Gazebos for towels and Sigi’s bar around the corner offers refreshments on tap. 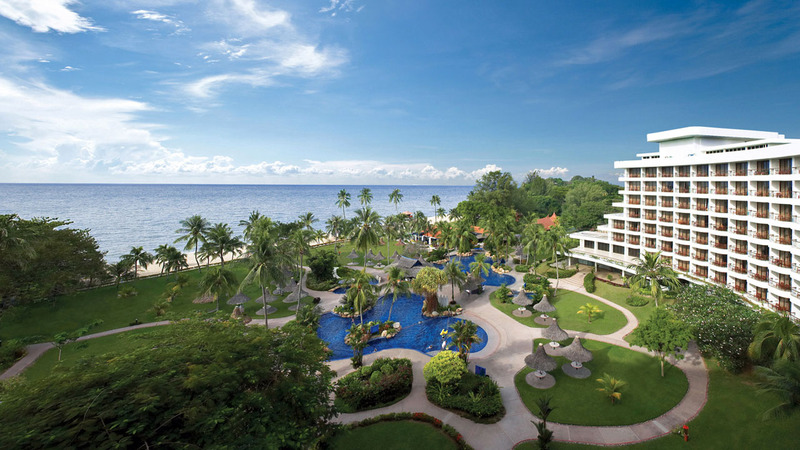 Also just around the corner is the CHI spa, a main feature of the Rasa Sayang Resort but full access for Golden Sands guests (separate charges apply). If lounging by the pool and beach were not enough, Golden Sands Resort also offers a never-ending array of daily activities, from pilates to jungle, golf putting to speak raga (a local ball game) there are activities to match every level of fitness and requirements. As a family-friendly resort, Golden Sands works hard to both accommodate and entice it’s younger guests offering a range of family-friendly and kids only activities from the huge indoor Adventure Zone to the Cool Zone Kids Club, Golden Sands has all bases covered for the children. For parents wanting some ‘grown up’ time, the resort offers a full day Kids Club, the Cool Zone Kids Club for children aged 5 to 12 years. This wrap around service also provides lunch and dinner for the children Mobile phones are also available on loan for parents who wish to keep in touch with their children. A Kid’s passport is available for 24 or 48 hours specifically for children to explore the various offerings at Golden Sands hotel. A complimentary t-shirt along with three hours of play at Adventure Zone, complimentary lunch, snack and a free ice cream is provided to children with the Kid’s Passport. A book of vouchers allow children to trade coupons for various offerings. The Adventure Zone is Golden Sand’s hotel magnificent contribution to family fun. The 10,300-sqf indoor facility caters to a range of family-style activities, allowing children, teens and adults to interact together in a safe environment. Complete with gigantic slides and adult sized climbing frames, the Adventure Zone allows entire families to participate in physically challenging obstacles in a comfortable air conditioned environment, away from the tropical heat. Visitors to Adventure Zone are required to be dressed appropriately including long sleeved tops, sock and tracks. While it may not be immediately obvious, the Golden Sands swimming pool consists of a series of interconnecting pools originally designed to mimic the petals and layout of an orchid. When viewed from a high vantage point, it is possible to make out the arrangement of the flower, despite the new additions and refurbishments to the original swimming pool. The Golden Sands is perfect for families looking for a balance between family friendly activities, child-focused fun and adult-focussed activities. It offers a range of great range of all while thoughtfully considering the time factors and need for parents to have down time. The range of activities available to both adults and children ensure that a stay at the Golden Sands Resort will be one in which you are able to keep as busy as possible or to just laze and enjoy your time by the pool side soaking up the sunshine.